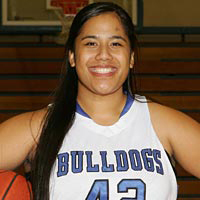 Alisi was the Most Inspirational Player for the bulldogs last year. Her leadership and enthusiasm will be relied on to help the bulldogs this season. She is a strong post and rebounder. She is an excellent student majoring in Nursing. In high school she earned MVP for basketball. She was also named the Athlete of the Week by the San Mateo Times. She enjoys listening to music, shopping, and hanging out with friends. She is very active in her church as well. She hopes to transfer after this year and improve her game this season.